1945 Enlisted at 16 and ½ years old into the Army Air Corps. Started at Fort Hays, Columbus then Atterbury, Indiana then Mississippi then to Buckley Field, Colorado. Charles was part of the ground crew which consisted of the maintaining the planes. 1945 Charles most memorable experience was when the Colonel found out he was under age and said that he had a 10 year commitment in federal prison. So Charles was discharged. 1952 Years later Charles received a notice that he was drafted and he said he already served his time however he unknowingly signed a 10 year reserve contract. Charles would go onto server 2 and 1/2 years in Korea on a 155MM Howitzer. 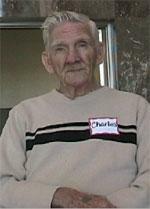 Charles really remembers the days at Heartbreak Ridge of intense firefighting and the strict secrecy. Enlisted at 16 and ½ years old into the Army Air Corps.